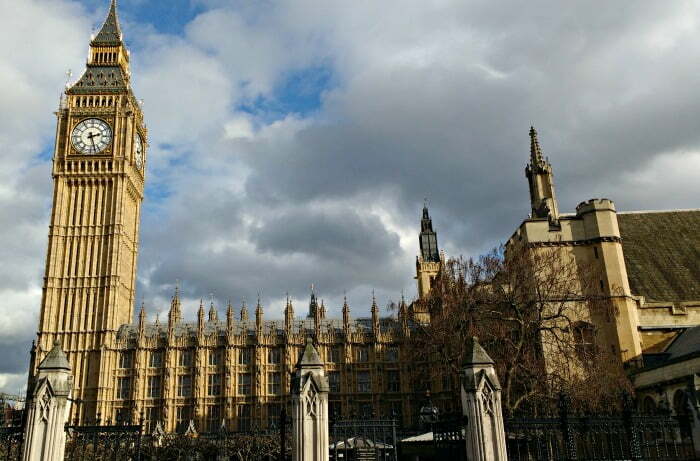 I spent a lot of time thinking about things to do in London with our 5 year old and 2 year old boys when we were there on a mini break in February. Open top bus tour? No, it would be too cold in February to sit on the top deck (which we would inevitably have to do). Boat tour? Maybe, but would be it be too long for their short attention spans? Then I remembered about the funny bright yellow vehicles which I had seen taking passengers around the main sites of London before diving into the River Thames. The London Duck Tour? Yes, that would be perfect for our boys. It would combine a bus tour and a boat tour with a bit of adventure – and I knew they would be really excited about driving into the River Thames! 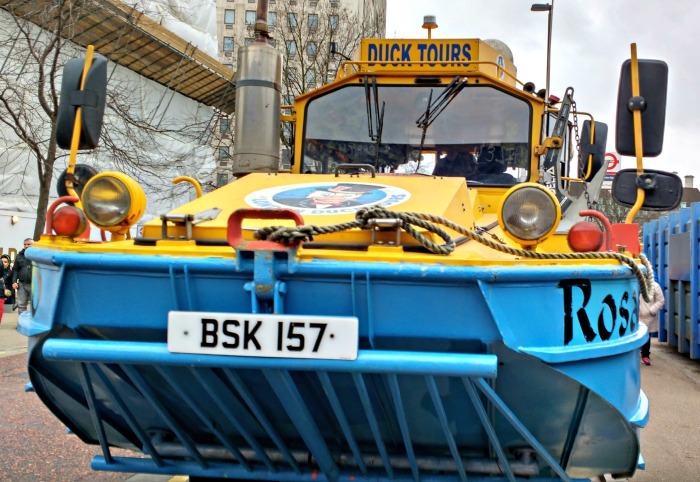 The London Duck Tour takes passengers on a 75 minute ‘Amphibious Adventure’ around London, including the excitement of driving off the road into the river. At just over an hour long, the tour is fast moving, exciting and just the right length of time to keep even the most fidgety toddler happy. Big Ben from the Duck! The tour is accompanied by a knowledgeable and fun tour guide, who was full of useful (and useless) facts which appealed to parents and toddlers alike. Her knowledge and love of London was infectious, and the tour was pitched at just the right level to keep us all entertained. 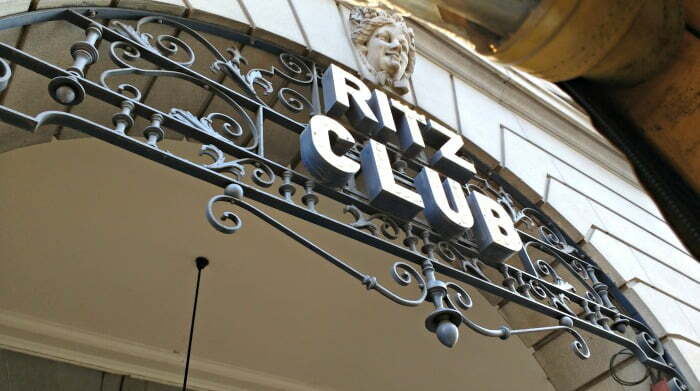 Passing the Ritz on the Duck! 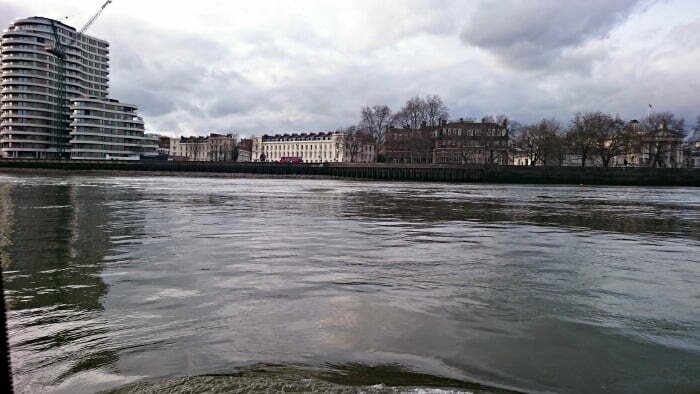 It took about 45 minutes to get round the sites above, before we arrived at the MI6 building at the Vauxhall part of the river. Our driver got us into position (pointing down a one way slope into the river) before he hopped out, and another driver who was qualified to drive a boat jumped in. The excitement was rising now, as the boys realised that this was the time our ‘bus’ was going to go in the river. ‘Are we going to sink?’ the 5 year old asked? ‘Are we going to go splash?’ the Toddler asked? After a quick safety demo, we were zooming down the slope into the river Thames, and powered by the large propeller at the back of the Duck, our ‘bus’ had turned into a ‘boat’. 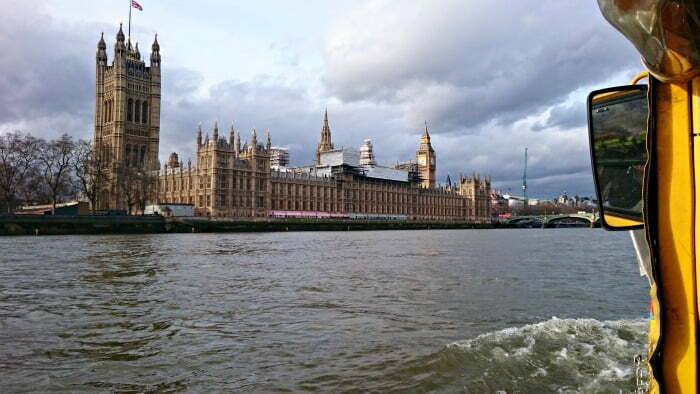 The tour continued down the river for about 15 minutes before turning at the Houses of Parliament and coming back up to MI6 and out of the river. Then it was about a 5 minute journey back to the Southbank where the tour finished. 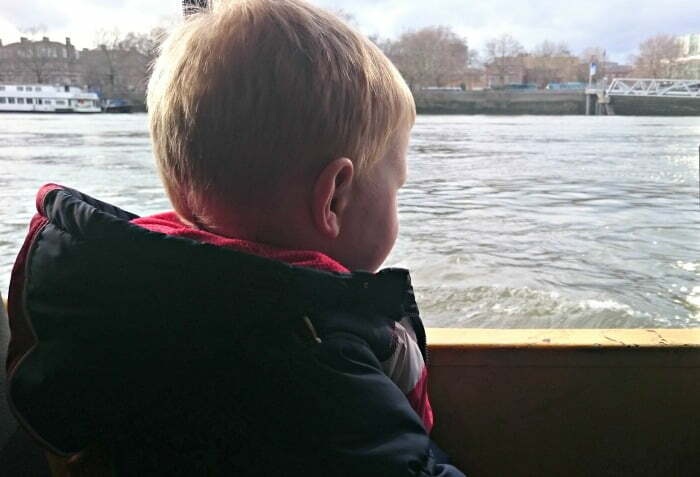 London Duck Tour: Toddler Friendly? watching things out of the window. Younger toddlers, or toddlers who have just started walking, might not like sitting down for an hour and may get frustrated because there isn’t anywhere for them to safely toddle off to. There aren’t any enclosed windows on the Duck so parents will have to keep a good grip on little ones who like climbing. Our whole family loved the London Duck Tour, and I would wholeheartedly recommend it to families wanting to do something a little bit ‘different’ in London. The tour is just the right length of time for toddlers and going in the river was really exciting for all of us (not just the kids!). No food and drink is allowed on board. Get there about 15 / 20 minutes beforehand, as when it comes to boarding the tour, you are able to get on the Duck in the priority order of who checked in first. The tour has open ‘window’s’ so wrap up warm. Buggies aren’t allowed on board, but they can be left at the check in desk. Prebooking online is recommended as the tours do get busy. 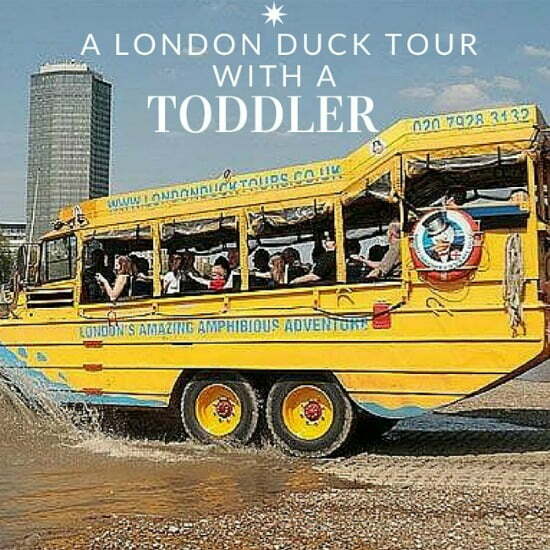 Go to London Duck Tours to book. The tour is not recommended for children under the age of 3, but passengers under 3 are permitted to travel at parent’s discretion. I currently have a 3.5 year old whose favourite imagination play is to be a car that turns into a boat or a submarine. Can you imagine his face if he was on a bus that turned into a boat?! He’d flip out with excitement! This is such a brilliant thing – I have no idea when or how I’d pull this one off but I must! Thanks for bringing it to my attention. I love the different approaches your boys took when wondering what would happen when the boat went in the water. So funny! Great tips too – very useful to know things like there are no windows (eep) and no toilet! Thanks for linking to #daysoutwithatoddler – see you next month! Thanks a lot for your comments! 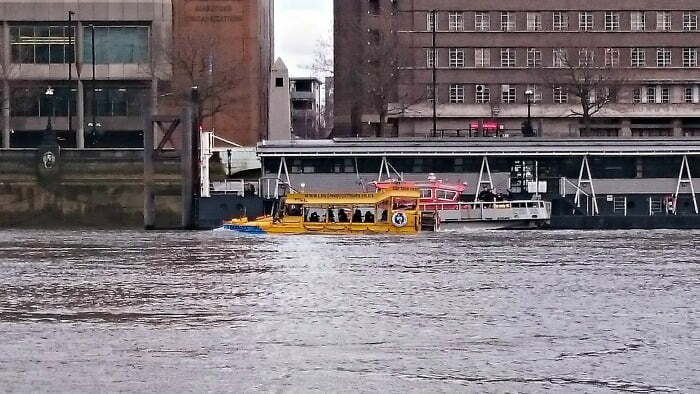 I have to say that the Duck Tour was our favourite thing from our London trip – it was so much fun! The tour guide was great too and really knew how to interact with the kids. Definitely give it a go next time you are in London. You really should – my toddler loved it! It was just the right length of time too – not too long for them to get bored. Thanks Elizabeth! I’d definitely recommend the Duck Tour- the tour guides are full of interesting facts and really know how to interact with children. I’d love to know if / how you get on on the Boston Duck Tour Elizabeth! I bet it will be great whatever country you do it in!